Aluminum and magnesium alloys are common materials found in machine shops worldwide, and are known as an “easier” material to machine. However, machinists can still experience hiccups while machining this material if they are not prepared with the proper tooling.. When working with aluminum and magnesium alloys, it is important to choose a coating that will work to extend your tool’s life and aid in the removal of chips. A popular choice for this material bucket is Harvey Tool’s TiB2 coating. What is Harvey Tool’s TiB2 Coating? Harvey Tool’s TiB2 coating is a Titanium Diboride, ceramic-based coating that provides superb erosion resistance during machining. TiB2 is added to a tool by a method called Physical Vapor Deposition (PVD), which is conducted in a vacuum where particles are vaporized and applied onto a surface, forming thin layers of material onto the properly-prepped tool. This method enables the coating to be corrosion and tarnish resistant. TiB2 is identified in Harvey Tool’s product catalog with a “-C8” following the sku number. It can be found offered in Harvey Tool’s lines of Variable Helix End Mills for Aluminum Alloys, Double Angle Shank Cutters, and Miniature High Performance Drills for Aluminum Alloys. When Should a Machinist Use TiB2? TiB2 has an extremely low affinity to aluminum, which helps with the chip evacuation process. Simply, chips of a material are able to evacuate through chip valleys easier if they don’t have a high affinity to the coating being used. TiB2 coating does not chemically react with aluminum and magnesium, which allows for smoother chip evacuation, as the chips do not stick to the coating and create issues such as chip packing. This is a common machining mishap that can cause both part and tool damage, quickly derailing a machining operation. By using a coating that increases the lubricity of the tool, chips will not have a surface to stick to and will more smoothly evacuate from the flutes of the tool. While an uncoated tool may work fine in some applications, not all applications can succeed without a tool coating. When working with large production runs where the tools need to hold up through the process of machining large numbers of parts, using a coating is always recommended because they extend the life of your tool. When is TiB2 Coating Not Beneficial to My Application? During the PVD coating process, tools can reach a temperature in excess of 500° F, which can cause the toughness of the carbide to drop slightly. This process does not normally compromise the performance of the tool due to the coating being placed over the carbide. The coating then protects the slightly weakened edge and increases tool performance in recommended materials. 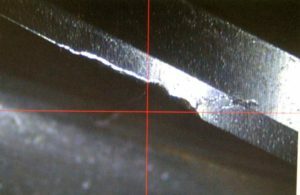 Micro-fractures only start appearing when the tool is being run incredibly fast through highly abrasive materials, leading to a decrease in the life of the tool. The coating, while only a few microns thick at most, still provides an ever-so-slight rounded edge to the cutting edge of the tools it is placed on. It is important to take this into consideration, as using the sharpest tools possible when working with materials such as soft plastics is recommended. The sharpest edge possible decreases the likelihood of any “pushing” that might occur on the material and increases the likelihood of proper “shearing” when machining. If your part’s finish is imperative to the final product, an uncoated tool may work better for your application. A coating, like stated above, creates a microscopic rounded surface to the cutting edge of the tool. When running tools at finishing speeds and feeds in materials like aluminum, a sharp edge can create the difference between a finished part that does – or does not – pass final inspection. Diamond tooling and diamond-coated end mills are a great option when machining highly abrasive materials, as the coating properties help to significantly increase tool life relative to uncoated carbide tools. Diamond tools and diamond-like coated tools are only recommended for non-ferrous applications, including highly abrasive materials ranging from graphite to green ceramics, as they have a tendency to break down in the presence of extreme heat. 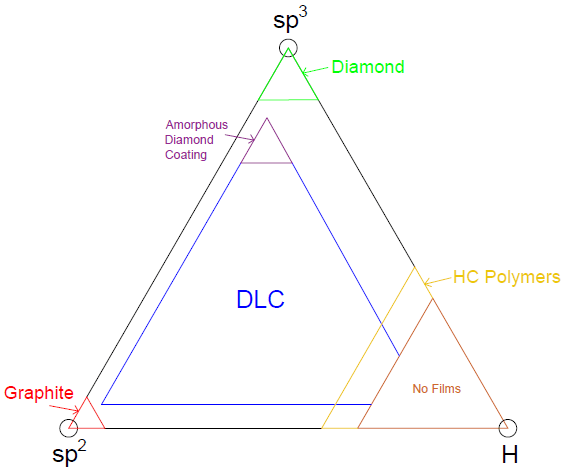 To ensure proper diamond tooling selection, it’s critical to understand the unique properties and makeup of the coatings, as there are often several diamond coating variations to choose from. Harvey Tool, for example, stocks Amorphous Diamond, CVD Diamond, and PCD Diamond End Mills for customers looking to achieve significantly greater tool life when working in non-ferrous applications. Diamond, the hardest known material on earth, obtains its strength from the structure of carbon molecules. Graphite, a relatively brittle material, can have the same chemical formula as diamond, but is a completely different material; while Graphite has a sp2 bonded hexagonal structure, diamond has a sp3 bonded cubic structure. The cubic structure is harder than the hexagonal structure as more single bonds can be formed to interweave the carbon into a stronger network of molecules. Amorphous Diamond is transferred onto carbide tools through a process called physical vapor deposition (PVD). 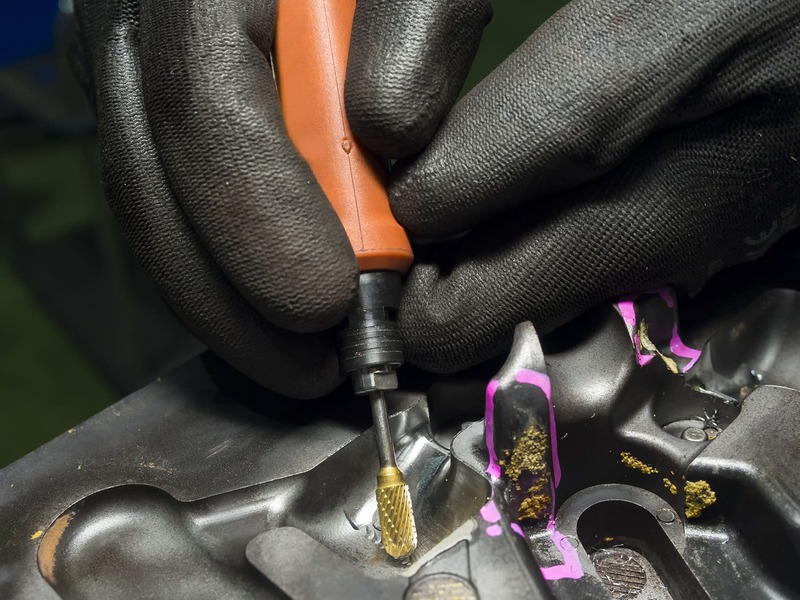 This process spreads a mono-layer of DLC coating about 0.5 – 2.5 microns thick onto any given tool by evaporating a source material and allowing it to condense onto that tool over the course of a few hours. Chemical Vapor Deposition (CVD) is a coating process used to grow multiple layers of polycrystalline diamond onto carbide tooling. This procedure takes much longer than the standard PVD coating method. During the coating process, hydrogen molecules are dissociated from the carbon molecules deposited onto the tool, leaving a diamond matrix under the right temperature and pressure conditions. Under the wrong conditions, the tool may be simply coated in graphite. 6% cobalt carbide blanks allow for the best adhesion of diamond and a substrate. CVD diamond coated end mills have a typical thickness of coating that is between 8 and 10 microns thick. Polycrystalline Diamond (PCD) is a synthetic diamond, meaning it is grown in a lab and contains mostly cubic structures. Diamond hardness ranges from about 80 GPa up to about 98 GPa. PCD end mills have the same diamond structure as CVD diamond tools but the binding technique is different. The diamond starts in a powdery form that is sintered onto a carbide plate using cobalt as a solvent metal substrate. This is done at an extreme temperature and pressure as the cobalt infiltrates the powder, causing the grains to grow together. This effectively creates a thick diamond wafer, between 010” and .030” in width, with a carbide base. This carbide base is then brazed onto the head an end mill and sharpened. Polycrystalline tools (CVD or sintered) have a much higher hardness, thickness, and max working temperature than Amorphous Diamond oated tools. As mentioned previously, a PCD tool consists of a diamond wafer brazed to a carbide body while a CVD tool is a carbide end mill with a relatively thick layer of polycrystalline diamond grown into it. 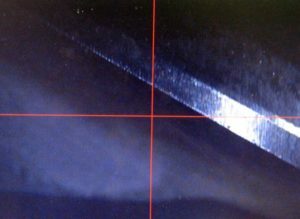 This grown layer causes the CVD tools to have a rounded cutting edge compared to PCD and Amorphous Diamond coated tools. PCD tools have the thickest diamond layer that is ground to a sharp edge for maximum performance and tool life. The difference between PCD tools and CVD coated tools lies in the thickness of this coat and the sharpness of the cutting edge. Amorphous Diamond tools maintain a sharper edge than CVD coated tools because of their thin coating. 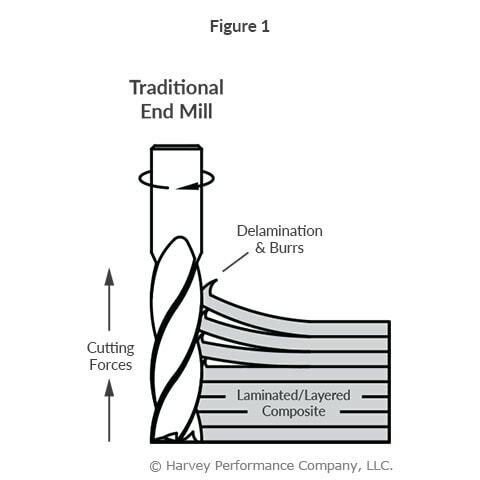 Harvey Tool’s line of PCD end mills are all straight fluted, CVD coated tools are all helically fluted, and Amorphous Diamond tools are offered in a variety of options. The contrast between straight fluted and helically fluted can be seen in the images below, PCD (top) and CVD (bottom). Electrical discharge machining, grinding or erosion are used cut the PCD wafer to the specifications. The size of this wafer limits the range of diameters that can be achieved during manufacturing. In most situations a helically fluted tool would be preferred over a straight fluted tool but with true diamond tooling that is not the case. The materials that PCD tools and CVD coated tools are typically used to cut produce a powdery chip that does not require the same evacuation that a metallic or plastic chip necessitates. CVD tools are ideally suited for abrasive material not requiring a sharp cutting edge – typically materials that produce a powdery chip such as composites and graphite. Amorphous Diamond tools have a broad range of non-ferrous applications spanning from carbon fiber to precious metals but ceramics are typically outside their range as they can be too abrasive and wear away the coating. PCD tools overlap their CVD and DLC coated counterparts as they can be used for any non-ferrous abrasive material. Harvey Tool carries physical vapor deposition diamond-like carbon coated tools, chemical vapor deposition diamond tools and polycrystalline diamond tools. PCD tools are composed of the thickest diamond wafer brazed onto a carbide shank and are ground to a sharp edge. CVD coated tools have the diamond grown into a carbide end mill. Amorphous Diamond coated tools have the DLC coated onto them through the PVD process. For more information on the diamond coating best suited for your operation, contact a Harvey Tool Tech Team Member for immediate help. Deburring is a process in which sharp edges and burrs are removed from a part to create a more aesthetically pleasing final product. After milling, parts are typically taken off the machine and sent off to the Deburring Department. Here, the burrs and sharp points are removed, traditionally by hand. However, an operation that takes an hour by hand can be reduced to mere minutes by deburring parts right in the machine with high precision CNC deburring tools, making hand deburring a thing of the past. Hand deburring tools often have a sharp hook-shaped blade on the end, which is used to scrape/slice off the burrs as it passes along the edge of the part. These tools are fairly simple and easy to use, but much less efficient and precise than CNC deburring tools. CNC deburring tools are also held to much tighter tolerances than traditional hand-deburring tools. 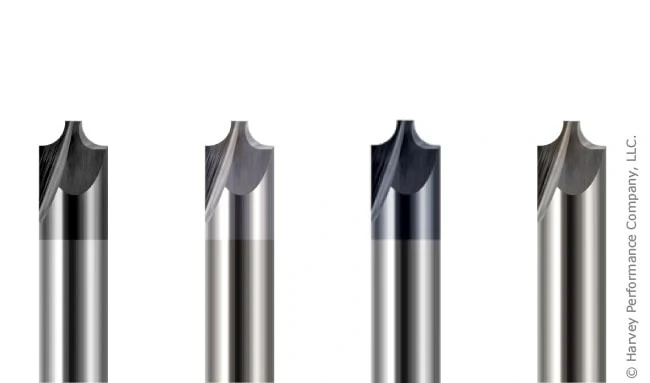 Traditional cylindrical deburring tools typically have a diameter-tolerance window of +/- .008 versus a CNC deburring end mill which has a diameter tolerance of +/-.0005. The tighter tolerance design eliminates the location issues found in traditional deburring tools with loose tolerances, allowing them to be programmed like a traditional end mill. While hand deburring tools often have just a single blade, CNC deburring tools feature double cut patterns and a high number of flutes. The double cut pattern contains both right hand and left hand teeth, which results in an improved finish. These tools leave completed parts looking far superior to their hand-deburred counterparts, with more consistent and controlled edge breaks. Additionally, there is a large variety of CNC deburring tools available today which can take full advantage of multi-axis machines and the most complex tool paths. For example, Harvey Tool’s 270° Undercutting End Mill is a great choice for multi-axis and more complex deburring options. Further, Deburring Chamfer Cutters are multi-use tools that can perform both chamfering and deburring accurately with no need for a tool change. Having an entire department dedicated to deburring can be costly, and many smaller businesses may have pulled employees off other jobs to help with deburring, which hampers production. Taking employees off the deburring station and asking them to run more parts or man another department can help keep labor costs low while still increasing production rates. By deburring right in the CNC machine, parts can be completed in one machining operation. The double-cut pattern found on many deburring tools also allows for increased speeds and feeds. This helps to reduce cycle times even further, saving hours of work and increasing production efficiency. Deburring in the machine is a highly repeatable process that reduces overall cycle times and allows for more efficient finishing of a part. In addition, CNC machines are going to be more accurate than manual operations, leading to fewer scrapped parts due to human error and inconsistencies. Simply put, the precision and accuracy of the CNC machine, along with the cost and time savings associated with keeping the part in the machine from start to finish, makes deburring in the CNC machine one of the easiest way to increase your shop’s efficiency. Determining the right speeds and feeds for your tool and operation can be a complicated process, but understanding the ideal speed (RPM) is necessary before you start running your machine. Running a tool too fast can cause suboptimal chip size or even catastrophic tool failure. Conversely, a low RPM can result in deflection, bad finish, or simply decreased metal removal rates. If you are unsure what the ideal RPM for your job is, contact the tool manufacturer. Another critical aspect of speeds and feeds, the best feed rate for a job varies considerably by tool type and workpiece material. If you run your tool with too slow of a feed rate, you run the risk of recutting chips and accelerating tool wear. If you run your tool with too fast of a feed rate, you can cause tool fracture. This is especially true with miniature tooling. While traditional roughing is occasionally necessary or optimal, it is generally inferior to High Efficiency Milling (HEM). HEM is a roughing technique that uses a lower Radial Depth of Cut (RDOC) and a higher Axial Depth of Cut (ADOC). This spreads wear evenly across the cutting edge, dissipates heat, and reduces the chance of tool failure. 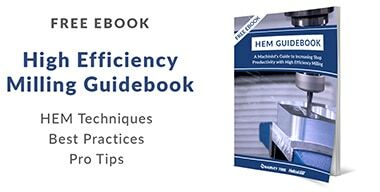 Besides dramatically increasing tool life, HEM can also produce a better finish and higher metal removal rate, making it an all-around efficiency boost for your shop. Proper running parameters have less of an impact in suboptimal tool holding situations. A poor machine-to-tool connection can cause tool runout, pullout, and scrapped parts. Generally speaking, the more points of contact a tool holder has with the tool’s shank, the more secure the connection. Hydraulic and shrink fit tool holders offer increased performance over mechanical tightening methods, as do certain shank modifications, like Helical’s ToughGRIP shanks and the Haimer Safe-Lock™. A feature on a variety of high performance end mills, variable helix, or variable pitch, geometry is a subtle alteration to standard end mill geometry. This geometrical feature ensures that the time intervals between cutting edge contact with the workpiece are varied, rather than simultaneous with each tool rotation. This variation minimizes chatter by reducing harmonics, which increases tool life and produces superior results. Despite being marginally more expensive, a tool with a coating optimized for your workpiece material can make all the difference. Many coatings increase lubricity, slowing natural tool wear, while others increase hardness and abrasion resistance. However, not all coatings are suitable to all materials, and the difference is most apparent in ferrous and non-ferrous materials. For example, an Aluminum Titanium Nitride (AlTiN) coating increases hardness and temperature resistance in ferrous materials, but has a high affinity to aluminum, causing workpiece adhesion to the cutting tool. A Titanium Diboride (TiB2) coating, on the other hand, has an extremely low affinity to aluminum, and prevents cutting edge build-up and chip packing, and extends tool life. While a long length of cut (LOC) is absolutely necessary for some jobs, especially in finishing operations, it reduces the rigidity and strength of the cutting tool. As a general rule, a tool’s LOC should be only as long as needed to ensure that the tool retains as much of its original substrate as possible. The longer a tool’s LOC the more susceptible to deflection it becomes, in turn decreasing its effective tool life and increasing the chance of fracture. As simple as it seems, a tool’s flute count has a direct and notable impact on its performance and running parameters. A tool with a low flute count (2 to 3) has larger flute valleys and a smaller core. As with LOC, the less substrate remaining on a cutting tool, the weaker and less rigid it is. A tool with a high flute count (5 or higher) naturally has a larger core. However, high flute counts are not always better. Lower flute counts are typically used in aluminum and non-ferrous materials, partly because the softness of these materials allows more flexibility for increased metal removal rates, but also because of the properties of their chips. Non-ferrous materials usually produce longer, stringier chips and a lower flute count helps reduce chip recutting. 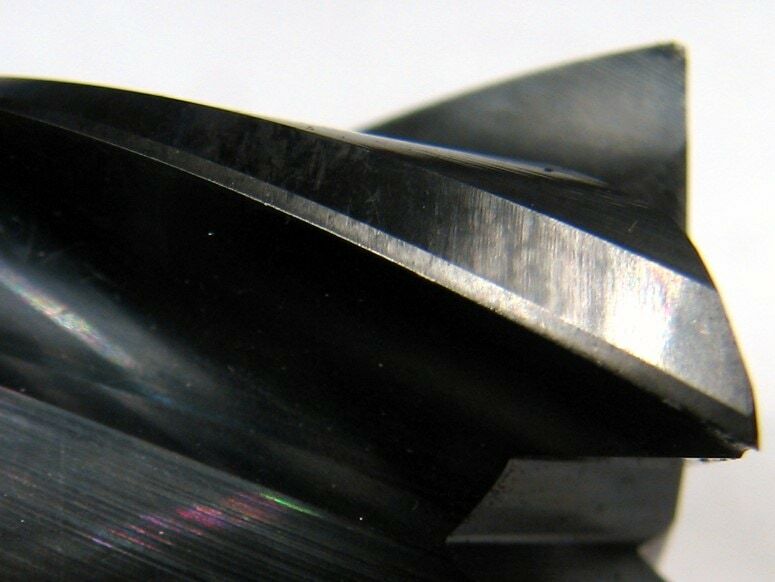 Higher flute count tools are usually necessary for harder ferrous materials, both for their increased strength and because chip recutting is less of a concern since these materials often produce much smaller chips. Coolant in purpose is widely understood – it’s used to temper high temperatures common during machining, and aid in chip evacuation. However, there are several types and styles, each with its own benefits and drawbacks. Knowing which coolant – or if any – is appropriate for your job can help to boost your shop’s profitability, capability, and overall machining performance. Coolant and lubricant are terms used interchangeably, though not all coolants are lubricants. Compressed air, for example, has no lubricating purpose but works only as a cooling option. Direct coolants – those which make physical contact with a part – can be compressed air, water, oil, synthetics, or semi-synthetics. When directed to the cutting action of a tool, these can help to fend off high temperatures that could lead to melting, warping, discoloration, or tool failure. Additionally, coolant can help evacuate chips from a part, preventing chip recutting and aiding in part finish. Coolant can be expensive, however, and wasteful if not necessary. Understanding the amount of coolant needed for your job can help your shop’s efficiency. Coolant is delivered in several different forms – both in properties and pressure. The most common forms include air, mist, flood coolant, high pressure, and Minimum Quantity Lubricant (MQL). Choosing the wrong pressure can lead to part or tool damage, whereas choosing the wrong amount can lead to exhausted shop resources. Air: Cools and clears chips, but has no lubricity purpose. Air coolant does not cool as efficiently as water or oil-based coolants. For more sensitive materials, air coolant is often preferred over types that come in direct contact with the part. This is true with many plastics, where thermal shock – or rapid expansion and contraction of a part – can occur if direct coolant is applied. Mist: This type of low pressure coolant is sufficient for instances where chip evacuation and heat are not major concerns. Because the pressure applied is not great in a mist, the part and tool do not undergo additional stresses. Flood (See Video Below): This low pressure method creates lubricity and flushes chips from a part to avoid chip recutting, a common and tool damaging occurrence. High Pressure (See Video Below): Similar to flood coolant, but delivered in greater than 1,000 psi. This is a great option for chip removal and evacuation, as it blasts the chips away from the part. While this method will effectively cool a part immediately, the pressure can be high enough to break miniature diameter tooling. This method is used often in deep pocket or drilling operations, and can be delivered via coolant through tooling, or coolant grooves built into the tool itself. Harvey Tool offers Coolant Through Drills and Coolant Through Threadmills. 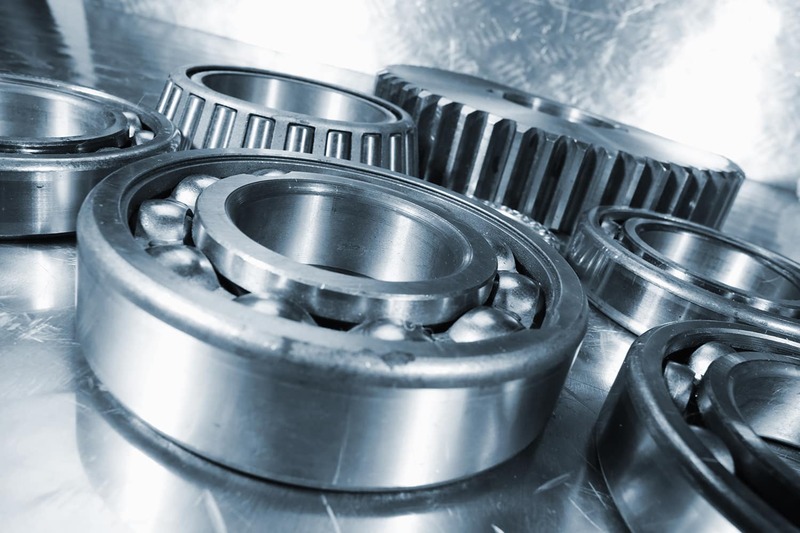 Minimum Quantity Lubricant (MQL): Every machine shop focuses on how to gain a competitive advantage – to spend less, make more, and boost shop efficiency. That’s why many shops are opting for MQL, along with its obvious environmental benefits. Using only the necessary amount of coolant will dramatically reduce costs and wasted material. This type of lubricant is applied as an aerosol, or an extremely fine mist, to provide just enough coolant to perform a given operation effectively. Coolant is all-too-often overlooked as a major component of a machining operation. The type of coolant or lubricant, and the pressure at which it’s applied, is vital to both machining success and optimum shop efficiency. Coolant can be applied as compressed air, mist, in a flooding property, or as high pressure. Certain machines also are MQL able, meaning they can effectively restrict the amount of coolant being applied to the very amount necessary to avoid being wasteful. Work hardening is often an unintentional part of the machining process, where the cutting tool generates enough heat in one area to harden the workpiece. This makes for a much more difficult machining process and can lead to scrapped parts, broken tools, and serious headaches. During machining, the friction between the tool and the workplace generates heat. The heat that is transferred to the workpiece causes the structure of the material to change and in turn harden the material. The degree to which it is hardened depends on the amount of heat being generated in the cutting action and the properties of the material, such as carbon content and other alloying elements. The most influential of these alloying elements include Manganese, Silicon, Nickel, Chromium, and Molybdenum. While the hardness change will be the highest at the surface of the material, the thermal conductivity of the material will affect how far the hardness changes from the surface of the material. Often times, the thermal properties of a material that makes it appealing for an application are also the main cause of its difficulty to machine. For example, the favorable thermal properties of titanium that allow it to function as a jet turbine are the same properties that cause difficulty in machining it. As previously stated, work hardening can create some serious problems when machining. 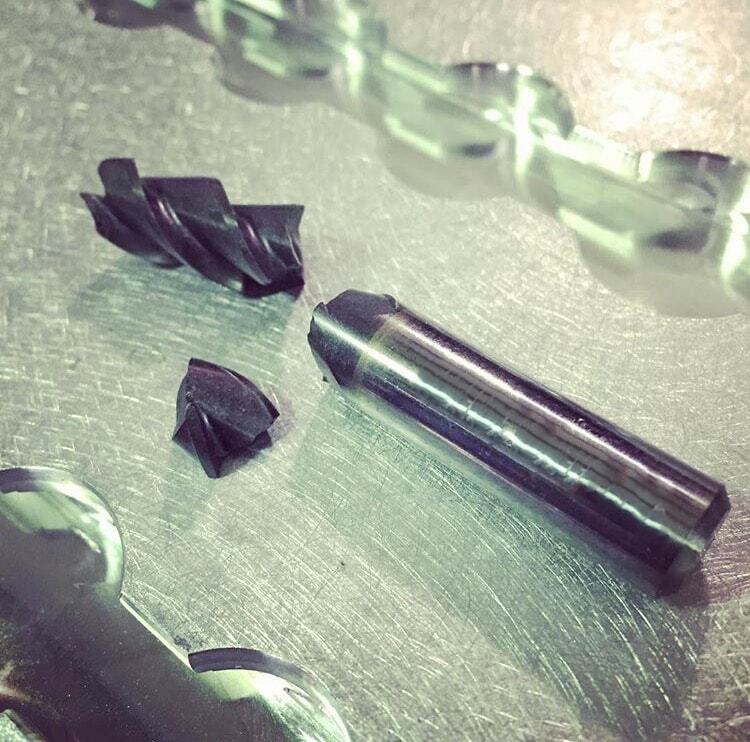 The biggest issue is heat generated by the cutting tool and transferring to the workpiece, rather than to the chips. When the heat is transferred to the workpiece, it can cause deformation which will lead to scrapped parts. Stainless Steels and High-Temp Alloys are most prone to work hardening, so extra precaution is needed when machining in these materials. One other issue that scares a lot of machinists is the chance that a workpiece can harden to the point that it becomes equally as hard as the cutting tool. This is often the case when improper speeds and feeds are used. Incorrect speeds and feeds will cause more rubbing and less cutting, resulting in more heat generation passed to the workpiece. In these situations, machining can become next to impossible, and serious tool wear and eventual tool breakage are inevitable if the tool continues to be fed the same way. There are a few main keys to avoiding work hardening: correct speeds and feeds, tool coatings, and proper coolant usage. As a general rule of thumb, talking to your tooling manufacturer and using their recommended speeds and feeds is essential for machining success. Speeds and feeds become an even bigger priority when you want to avoid heat and tool rubbing, which can both cause serious work hardening. More cutting power and a constant feed rate keeps the tool moving and prevents heat from building up and transferring to the workpiece. The ultimate goal is to get the heat to transfer to the chips, and minimize the heat that is transferred into workpiece and avoiding any deformation of parts. While friction is often the main culprit of heat generation, the appropriate coating for the material may help combat the severity. Many coatings for ferrous materials reduce the amount of friction generated during cutting action. This added lubricity will reduce the friction on the cutting tool and workpiece, therefore transferring the heat generated to the chip, rather than to the workpiece. Proper coolant usage helps to control the temperature in a cutting operation. Flooding the workpiece with coolant may be necessary to maintain the proper temperature, especially when machining in stainless steels and high-temp alloys. Coolant-fed tools can also help to reduce the heat at the contact point, lessening work hardening. While coolant-fed tools are typically a custom modification, saving parts from the scrap heap and using more machine time for the placement part will see the tool pay for itself over time. Composites are a group of materials made up of at least two unique constituents that, when combined, produce mechanical and physical properties favorable for a wide array of applications. These materials usually contain a binding ingredient, known as a matrix, filled with particles or fibers called reinforcements. Composites have become increasingly popular in the Aerospace, Automotive, and Sporting Goods industries because they can combine the strength of metal, the light weight of plastic, and the rigidity of ceramics. Unfortunately, composite materials present some unique challenges to machinists. Many composites are very abrasive and can severely reduce tool life, while others can melt and burn if heat generation is not properly controlled. 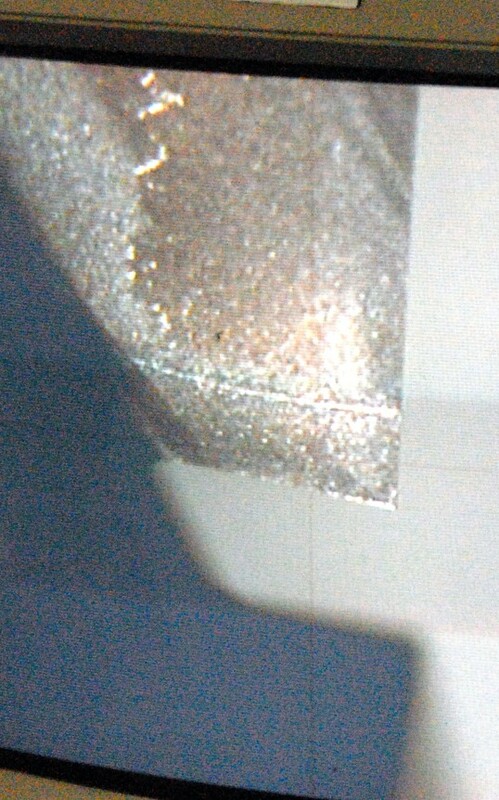 Even if these potential problems are avoided, the wrong tool can leave the part with other quality issues, including delamination. While composites such as G10 and FR4 are considered “fibrous”, composites can also be “layered,” such as laminated sheets of PEEK and aluminum. Layered composites are vulnerable to delamination, when the layers of the material are separated by a tool’s cutting forces. This yields less structurally sound parts, defeating the purpose of the combined material properties in the first place. In many cases, a single delaminated hole can result in a scrapped part. 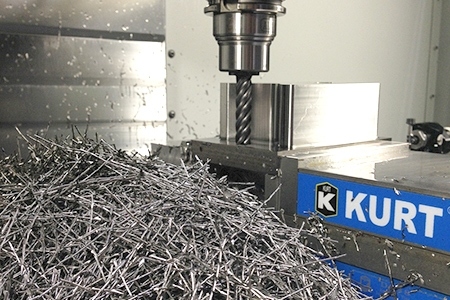 Composite materials are generally machined with standard metal cutting end mills, which generate exclusively up or down cutting forces, depending on if they have right or left hand flute geometry. These uni-directional forces cause delamination (Figure 1). Conversely, compression cutters are designed with both up and down-cut flutes. The top portion of the length of cut, closest to the shank, has a left hand spiral, forcing chips down. The bottom portion of the length of cut, closest to the end, has a right hand spiral, forcing chips up. When cutting, the opposing flute directions generate counteracting up-cut and down-cut forces. 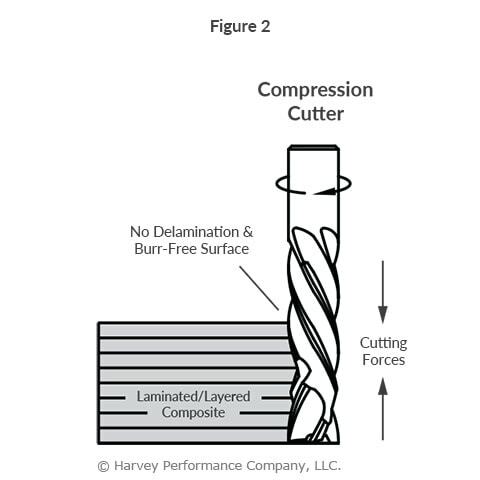 The opposing cutting forces stabilize the material removal, which compresses the composite layers, combatting delamination on the top and bottom of a workpiece (Figure 2). Since compression cutters do not pull up or press down on a workpiece, they leave an excellent finish on layered composites and lightweight materials like plywood. It is important to note, however, that compression cutters are suited specifically to profiling, as the benefits of the up and down-cut geometry are not utilized in slotting or plunging operations. Something as simple as choosing a tool suited to a specific composite material can have significant effects on the quality of the final part. Consider utilizing tools optimized for different composites and operations or learn how to select the right drill for composite holemaking. The following is just one of several blog posts relevant to High Efficiency Milling. To achieve a full understanding of this popular machining method, view any of the additional HEM posts below! Tool wear is the breakdown and gradual failure of a cutting tool due to regular operation. Every tool will experience tool wear at some point in its life. Excessive wear will show inconsistencies and have unwanted effects on your workpiece, so it is important to avoid tool wear in order to achieve optimal end mill performance. Tool wear can also lead to failure, which in turn can lead to serious damage, rework, and scrapped parts. To prolong tool life, identifying and mitigating the various signs of tool wear is key. Both thermal and mechanical stresses cause tool wear, with heat and abrasion being the major culprits. Learning how to identify the most common types of tool wear and what causes them can help machinists remedy issues quickly and extend tool longevity. The wear land is a pattern of uniform abrasion on the cutting edge of the tool, caused by mechanical abrasion from the workpiece. This dulls the cutting edge of a tool, and can even alter dimensions such as the tool diameter. At higher speeds, excessive heat becomes more of an issue, causing more damage to the cutting edge, especially when an appropriate tool coating is not used. If the wear land becomes excessive or causes premature tool failure, reducing the cutting speed and optimizing coolant usage can help. High Efficiency Milling (HEM) toolpaths can help reduce wear by spreading the work done by the tool over its entire length of cut. 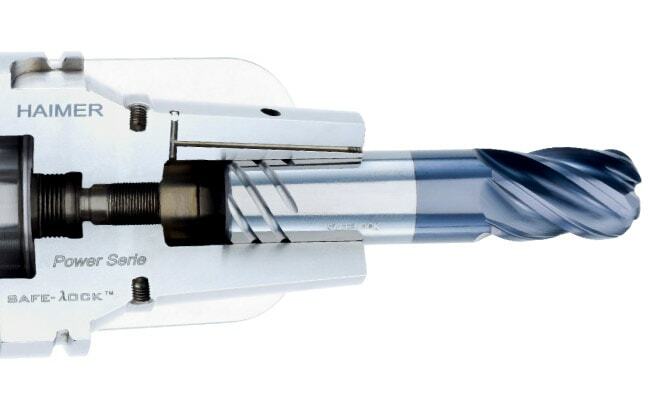 This prevents localized wear and will prolong tool life by using the entire cutting edge available. Chipping can be easily identified by a nicked or flaked edge on the cutting tool, or by examining the surface finish of a part. 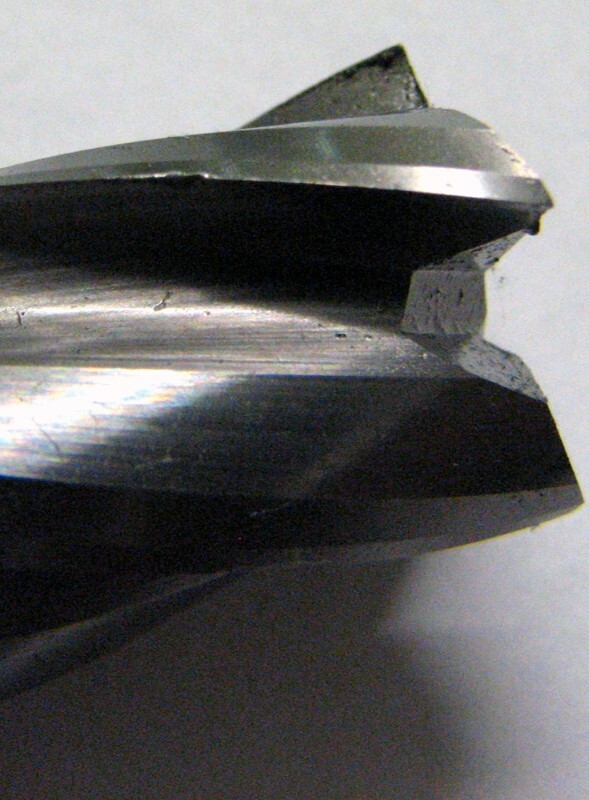 A poor surface finish can often indicate that a tool has experienced some sort of chipping, which can lead to eventual catastrophic tool failure if it is not caught. Chipping is typically caused by excessive loads and shock-loading during operation, but it can also be caused by thermal cracking, another type of tool wear which is explored in further detail below. To counter chipping, ensure the milling operation is completely free of vibration and chatter. Taking a look at the speeds and feeds can also help. Interrupted cuts and repeated part entry can also have a negative impact on a tool. Reducing feed rates for these situations can mitigate the risk of chipping. Thermal cracking is often identified by cracks in the tool perpendicular to the cutting edge. Cracks form slowly, but they can lead to both chipping and premature tool failure. Thermal cracking, as its name suggests, is caused by extreme temperature fluctuations during milling. 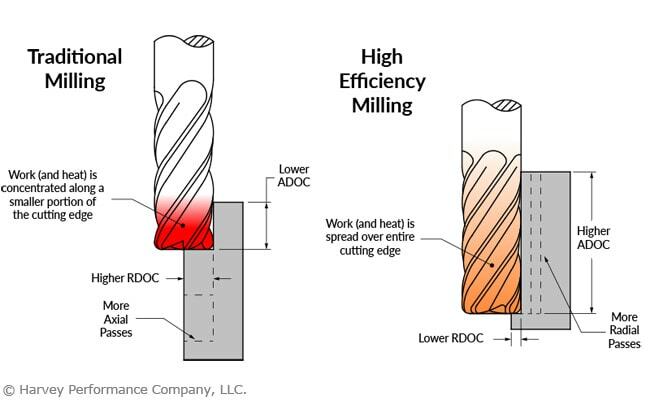 Adding a proper coating to an end mill is beneficial in providing heat resistance and reduced abrasion on a tool. HEM toolpaths provide excellent protection against thermal cracking, as these toolpaths spread the heat across the cutting edge of the tool, reducing the overall temperature and preventing serious fluctuations in heat. Fracture is the complete loss of tool usage due to sudden breakage, often as a result of improper speeds and feeds, an incorrect coating, or an inappropriate depth of cut. Tool holder issues or loose work holding can also cause a fracture, as can inconsistencies in workpiece material properties. Adjusting the speeds, feeds, and depth of cut and checking the setup for rigidity will help to reduce fracturing. Optimizing coolant usage can also be helpful to avoid hot spots in materials which can dull a cutting edge and cause a fracture. HEM toolpaths prevent fracture by offering a more consistent load on a tool. Shock loading is reduced, causing less stress on a tool, which lessens the likelihood of breakage and increases tool life. It is important to monitor tools and keep them in good, working condition to avoid downtime and save money. 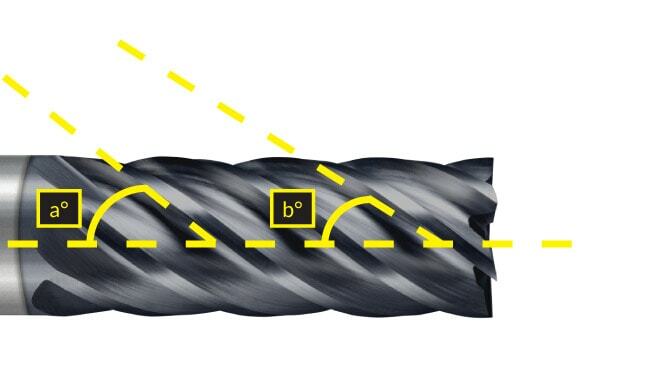 Wear is caused by both thermal and mechanical forces, which can be mitigated by running with appropriate running parameters and HEM toolpaths to spread wear over the entire length of cut. While every tool will eventually experience some sort of tool wear, the effects can be delayed by paying close attention to speeds and feeds and depth of cut. Preemptive action should be taken to correct issues before they cause complete tool failure.